1 A None No Power Seat 1 A has restricted legroom due to the position of the Bulkhead. While there is a cutout in the Bulkhead, it does not provide much legroom. This seat has a misaligned window. There is no floor storage for this seat during take-off and landing. 1 B None No Power Seat 1 B has restricted legroom due to the position of the Bulkhead. 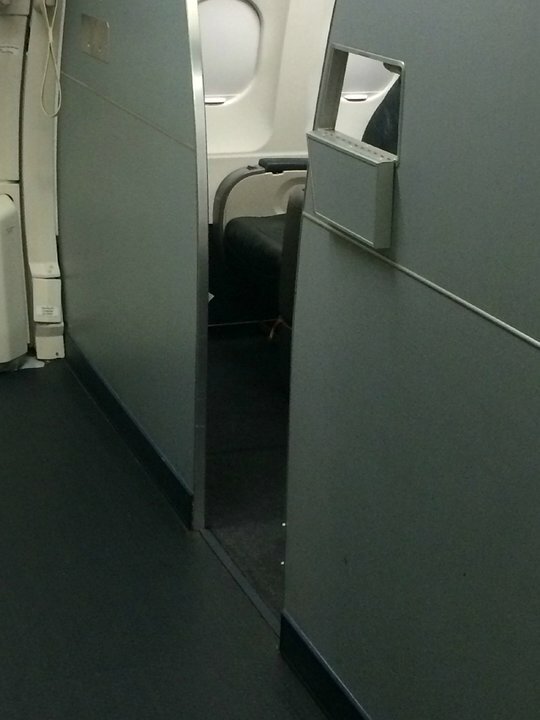 While there is a cutout in the Bulkhead, it does not provide much legroom. There is no floor storage for this seat during take-off and landing. 1 E None No Power Seat 1 E may have restricted legroom due to the position of the bulkhead. The proximity to the galley may be bothersome. There is no floor storage for this seat during take-off and landing. 1 F None No Power Seat 1 F may have restricted legroom due to the position of the bulkhead. This seat has a misaligned window. The proximity to the galley may be bothersome. There is no floor storage for this seat during take-off and landing. 20 A None No Power Seat 20 A is an Economy Plus seat that does not recline due to the Exit Row behind. 20 B None No Power Seat 20 B is an Economy Plus seat that does not recline due to the Exit Row behind. 20 C None No Power Seat 20 C is an Economy Plus seat that does not recline due to the Exit Row behind. 20 D None No Power Seat 20 D is an Economy Plus seat that does not recline due to the Exit Row behind. 20 E None No Power Seat 20 E is an Economy Plus seat that does not recline due to the Exit Row behind. 20 F None No Power Seat 20 F is an Economy Plus seat that does not recline due to the Exit Row behind. 21 A None No Power Seat 21 A may have extra legroom due to the exit door in front. 21 F None No Power Seat 21 F may have extra legroom due to the exit door in front. 34 C None No Power Seat 34 C is a standard Economy Class seat, however the close proximity to the lavatories and galleys may be bothersome. 34 D None No Power Seat 34 D is a standard Economy Class seat, however the close proximity to the lavatories and galleys may be bothersome. 35 A None No Power Seat 35 A is in the last row of the plane and does not recline. The close proximity to the lavatories and galleys may be bothersome. 35 B None No Power Seat 35 B is in the last row of the plane and does not recline. The close proximity to the lavatories and galleys may be bothersome. 35 C None No Power Seat 35 C is in the last row of the plane and does not recline. The close proximity to the lavatories and galleys may be bothersome. 35 D None No Power Seat 35 D is in the last row of the plane and does not recline. The close proximity to the lavatories and galleys may be bothersome. 35 E None No Power Seat 35 E is in the last row of the plane and does not recline. The close proximity to the lavatories and galleys may be bothersome. 35 F None No Power Seat 35 F is in the last row of the plane and does not recline. The close proximity to the lavatories and galleys may be bothersome. 7 A None No Power Seat 7 A may have some extra legroom due to the position of the bulkhead. The tray table is in the armrest, making the armrest immovable and slightly reducing seat width. 7 B None No Power Seat 7 B may have some extra legroom due to the position of the bulkhead. The tray table is in the armrest, making the armrest immovable and slightly reducing seat width. 7 C None No Power Seat 7 C may have some extra legroom due to the position of the bulkhead. The tray table is in the armrest, making the armrest immovable and slightly reducing seat width. 7 D None No Power Seat 7 D may have some extra legroom due to the position of the bulkhead. The tray table is in the armrest, making the armrest immovable and slightly reducing seat width. 7 E None No Power Seat 7 E may have some extra legroom due to the position of the bulkhead. The tray table is in the armrest, making the armrest immovable and slightly reducing seat width. 7 F None No Power Seat 7 F may have some extra legroom due to the position of the bulkhead. The tray table is in the armrest, making the armrest immovable and slightly reducing seat width. Individual 110v power ports are available in First. In Economy Plus, 110v power ports are shared between seats. This Airbus A319 (319) seats 128 passengers and is primarily used on Domestic routes. This next-generation aircraft features a First Class cabin outfitted with 8 recliner seats. The Economy Plus cabin is outfitted with 42 seats and Economy Class features 78 seats. 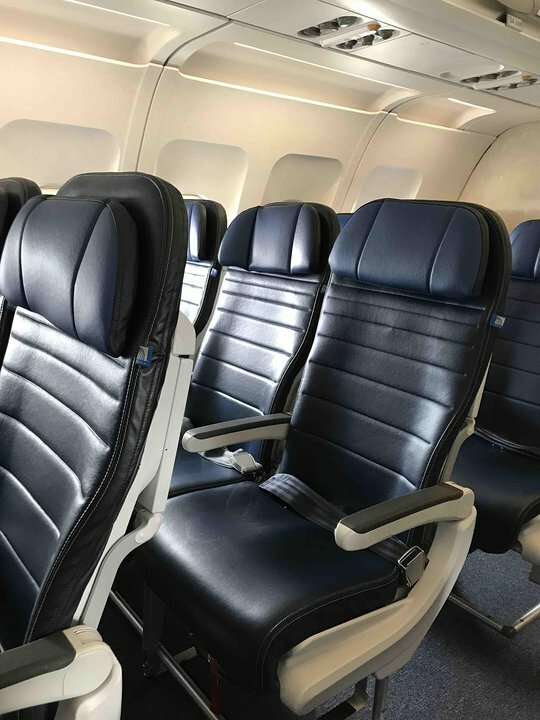 The Economy Cabin has been outfitted with Recaro's slimline seats that according to United boasts an extra inch of knee-space and another half-inch more headroom. United is currently in the process of outfitting their fleet of A319s with power ports in First and Economy Plus. So, power ports may not be available on your specific flight. Please check with the airline to confirm. Beware tall 1st class customers. I am 6'4", 235 lbs. and seats were very uncomfortable. Several issues. The food tray does not extend out far enough when open. It was right up against my stomach and with the meal tray it was even worse. Leg room is marginal at best and I found the cushions extremely hard. 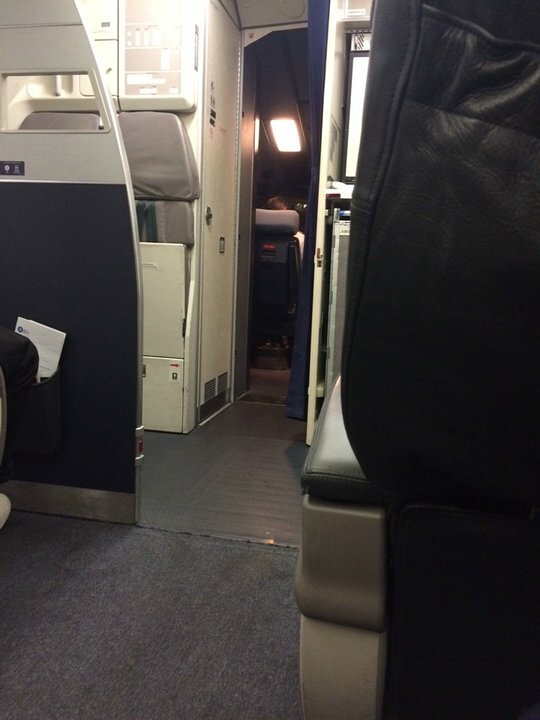 I flew 1st class on AA to my destination. It is now my preferred airline. Seat 8D is in Economy Plus, advertised with a 34 inch seat pitch. This planed seems to have the newer Recaro seats, and the seat felt a bit roomier than traditional seats with this pitch. I am 5'11, and my knees will touch the seats on small sets, but this was plenty roomy. There was enough room to comfortably accommodate a small laptop computer without being too cramped. The extra charge for this seat is money well spent, since recent experience in seats further aft suggest a much more cramped experience. Seat 2E is a good first class seat with ample elbow space, leg room, and recline, although a bit old and without much contour or posture support as one finds it with modern higher-grade airplane seats. It was my bad that I overlooked the SeatGuru warning No TV because I couldnt believe a first class seat on an international flight (CAN-USA) came without ANY entertainment. From my frequent international flights with other non-American airlines I was used to the formula the higher the class, the bigger the screen and the more generous the entertainment offering. Not so with UA deploying this plane. I was confined to watching movies on my little smartphone screen because thats where I happened to have installed the UA app. Without the latest app, no movie. And they charge extra for wireless access needed to stream videos. Not a bad first class seat. The wall behind the seat does not interfere with recline, but the seat cushion slides forward when reclining. Horrible seat. Not wide enough for anybody and no leg room at all. Could not even bend down and get my bag from under the seat in front. Forget trying to cross your legs! Had to lower the seat arms to scoot across to get out. Very uncomfortable. Kind of shocked at how much space I had - I could cross my legs (I'm 6'2). I for one like the new Recaro seating and the padding on the bottom is still better than an exit row. Had an empty middle next to me so it helped but three across with family would be a no brainer as far as transcon or Hawaii (if only they flew that far). Eco Plus sure beats the pants off of AA MCE. My tail was N896UA, a year out of retrofit, and still was the absolute cleanest plane I've ever been on. It's no Jet Blue Extra Space, but like I said, II'm a little shocked, in a good way.. Worse plane in the United fleet. It was old, loud, and just down right awful. As my first (and last) time on a United Airbus i have now determined I will always fly Boeing. If you want to walk off a flight with good knees and ears avoid the Airbus. This area has been updated by United and the coat racks are now behind row 2. This allows for a decent amount of additional legroom in this row. The lack of underseat storage was more bothersome to me personally. Seat is pretty comfortable but in no way is it lie flat. 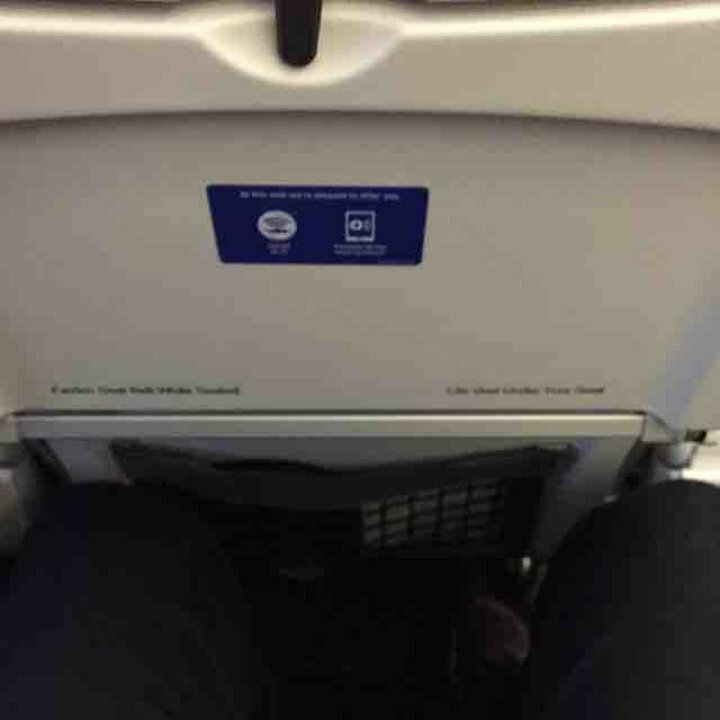 If you're tall your feet will bump the bulkhead but for me (5ft10) it was fine. Nice in flight service made up for the seat's slight shortcomings and I was first off the plane, which was nice. How you enjoy this seat will depend on your expectations! The regular Economy in this plane features some of the smallest seats I've ever seen on any plane. Luckily, I'm in an empty row but can't imagine how tight this would be on a full flight. On the outbound, I paid for Economy Plus, but there was a chubby guy next to me and it was tight. Also, my elbow hurts from how it hits against the window wall when I'm typing. Worst experience ever! I had the misfortune of having to fly United from San Francisco to Chicago's O'Hare on this dreadful A319. I am 5' 10" and average build and I felt extremely cramped. The seats on this plane are so uncomfortable I think i would have preferred to sit on a park bench. My lower back began to hurt mid flight. I am 25 years old and I have never had back pain. The poor old lady sitting next to me was basically suffering the whole flight. To make matter worse there was no in flight entertainment system and United charges exorbitantly for wifi by the hour (not that I had space to use my ipad or macbook anyway). And the flight had no hot food to offer despite their food menu and only had pretzels and a snack box. I was given a measly cup of ginger ale (not the whole can). Like wow! I fly JetBlue out of my hometown NYC and the experience is soooo much better. United is inhumane...Why on earth would anyone would choose to fly with them? Very pleasant 3-1/2 journey from ORD to MEX. The seat was comfortable and reclined more than I thought it would. The crew were pleasant and i could actually eat the food. The window seat protrudes a bit into the shoulder and arm area. It was a bit annoying. Den to Phx flight, really liked new seats on the A319. Not an Airbus fan, but this flight was quiet and seat very comfortable. There was power available, but there was NO cutout for additional foot space. Could not extend my legs all the way and I'm only 5'7". Somewhat limited storage overhead as well as the bulkhead no storage under seat in front. There is good floorboard space for row 7, despite it being first row of economy plus. The new standard...no more than 31" pitch max. I will say the. Bottom seat cusion seem a bit plusher than Alaska's Recaro seats, but basically no recline. The pitch is very small and no entertainment on a 4.5 hour IND to SFO. The seat itself is padded well and comfortable, but getting out for the bathroom is a chore. Great Econ+ seat. Felt very comfortable on my 2 hour flight and could have twice that long and been fine. I am just under 6". One and a half windows. Love having the power plug in back of the seat ahead rather than under one's seat - much easier to access. The United A319 is a comfortable aircraft for domestic routes. Although some people complained about the seats, they are relatively comfortable and feel wide enough. I enjoyed that we had power outlets, although the personal device entertainment did not work very well. No padding to speak of and seat bottom angles forward sliding you you out of seat. Quite unpleasant! Paying extra for Economy Plus and getting a bulkhead seat was well worth it. I am 6-3 and was wary about the 30" pitch, since the A319s on American at that pitch are miserable. Tons of footroom since you can actually put your feet under the first class seat ahead of you. Others noted that the seat cushion is not very deep and that is true. If you recline you almost get the sensation you are going to slide off. All-in-all this seat is just fine. This fight boarded at 5:10AM and the coffee shops don't open till 5:00 and there was a long line waiting. I was jealous of the first class guys getting their coffee while still at the gate. But I have to say when I got my coffee it was the best cup of coffee I've ever gotten on a airplane. Good cookie too, and that made the flight very satisfactory. All of the seats in exit row 21 have extra leg room compared to a regular Economy Plus seat,and all of the seats in row 21 have the same amount of leg room so all seats i that row should have a green designation. The flight attendant told me United removed the coat closet and made the galley smaller to make more leg room for Row1. There is definitely more leg room now than shown in the older photos posted of Row1. Good move United. I agree w/ comments, the seats are a sinister way to make it appear that there is more knee room. Another comment: the seat is not deep enough front to back. There is not enough support for the thigh. This is another way comfort has been way cut down. These seats were horrible - incredibly tight and when the person in front reclines, sort of unbearable. First time with United in a while but if this is their standard then will stick with other airlines. The A319 I was in wasn't as bad as I expected. For a 3 hour flight form Calgary to Chicago, I actually had a decent experience. The A319 I was in had a refurbished cabin, with the economy cabin having new leather seats. Sure, the seat cushion was shorter, and there wasn't a lot of thigh and side support (which I expect much more from Recaro designing these seats), but the leather seats were surprisingly not hard, despite the padding being about 3 inches thick. Even though the 30 inch seat pitch might not sound a lot, for a 5 foot 1 inch person like me, it was actually more than decent enough. Recaro made the seats slimmer, so if somebody reclined (which an elder in front of me DID NOT recline ironically), the person in front of you wouldn't be sitting on your lap. The life jacket compartment in every seat did not interfere with my legroom at all. On this new cabin, it was very clean (and for a over 10 year plane, it still looks and smells new! ), but United has remove the overhead TVs on the refurbished cabin I was in (probably to save room), and the WiFi is like $7 US per person, but I was snoring happily away most of the time. I check most other passengers and even if you are 5 and a half feet tall, you will still have more legroom than a economy seat that hasn't been refurbished on a Boeing 737! I would give this plane a 8/10 for 3 hour or less routes, 7/10 for any routes longer. First time on this aircraft. At first I was thinking. Great a new plane. Then when I sat down I was cramped into the small seat. I always try to pick a window seat - for the view and the little extra room that a window gives me. I am small 5'1 weight 125 so I am not a big person. The seats are short and the headrest are tall. No support under the leg. Armrest a joke. especially if the passenger next to you takes over both arm rest. Uncomforatble flight will nopt book on this type plane again. If you are a heavy weight person or have long legs, spare your self the agony of trying to fit into these seats. Seems like it was a former Lufthansa plane... has the same setup. I am 5'4" and 120 pounds and seat was a tiny bit cramped. Wasn't awful for the 1.5 hour flight from PDX-SFO but wouldn't want to be on this plane for more than 3-3.5 hours. Worst flight of my entire life, and it was simply due to the horrendous seats. Despite the fact that they are brand new, the seats are so bad that I will never fly United ever again in my life, it really is that bad. I've never had such a PAINFUL experience in my life and I've flown easyJet, RyanAir, Spirit, and Allegiant. NEVER AGAIN! After reading other comments about how uncomfortable these seats were going to be, I expected much worse. On my 3 hour flight they were comfortable and I did feel like I had more legroom. I'm 5' 9" and of normal weight. 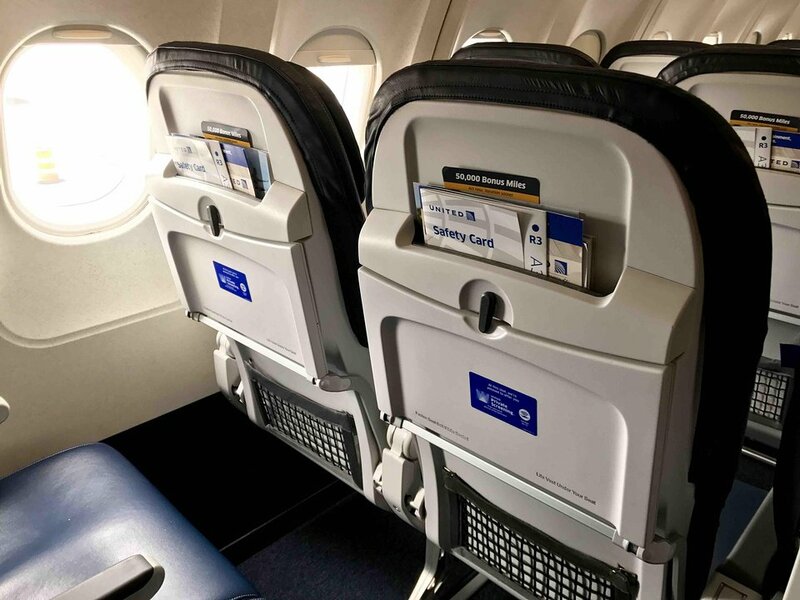 Compared to Allegiant slim seats, they're much more comfortable although of similar slimness. The person in front of me reclined his seat, but it was not a problem. The new slimline seat may be claimed to give extra kneeroom, but it certainly felt more claustrophobic because the "extra" room essentially comes from moving the magazine pocket up behind the mealtray, so that it's closer to your face. People around me were commenting about it, too. Thank goodness it was a short flight. Yes, they are the new slimline seats, but they also are too short so there is virtually no thigh support and the arm rests are so short that there is no place to put your arm. All in all, these new coach seats are much worse. United flies 1 versions of Airbus A319-100.